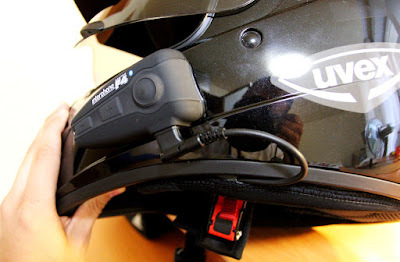 After two tries of making a perfect intercom for my helmet on my own: first solution with 3,5mm Jack connector was horrible (always some problems with contact in the connection), the second one with water-proof car connector was much better. Mainly because of improvement of sound quality and quality of the connection. But I still had to face the boring disconnection and connecting the cable on every gas station etc... That wasn't too comfy. So I decided to buy a Bluetooth solution. After some advice from my friends I decided to buy "Interphone F4+". I have to say that it was a nice surprise. Everything works how it should. The volume changes with respect to velocity (or better to say the noise level). The connecting to my GPS and my cell phone was also without any difficulties. I only had to modify my helmet little bit. Originaly I belived that it will be ok to place the speakers somewhere inside the helmet, that the speakers will be powerfull enough even when they are not exactly opposite the ears. Well, they were not. I had to remove some polystyren (by soldering gun and knife) in place where I wanted to place those speakers. After that I just place the speakers, all the cables, glued the intercom holder on the leftside of the helmet and just snaped the intercom. Now everything works how it is supposed to. GS Rider is the author of all pictures, videos and articles. Picture Window theme. Powered by Blogger.